Having covered Richard's work on the site, starting with the release of his horror short film Dogged, its been quite a thrill to watch the arduous - yet fulfilling - labor bear fruit for production company Ash Mountain Films. While successfully moving from short film to feature length brings with it a whole new level of promised potential for horror fans, it also carries with it new challenges for those involved in its production. But as you'll come to read, sometimes these challenges only serve to add to the fulfilling nature of independent filmmaking, pushing the artists to achieve more than they would have otherwise imagined. What drew you to filmmaking? How'd you get your start? I grew up in a tiny village just outside of London which also happens to be the location of Pinewood Studios (home of James Bond and now Star Wars too!) - as a kid all my friends dads used to work at the studios in some capacity - carpenters, prop makers, scenic painters, and so it was something which seemed quite ordinary to me (although I know of course now that it wasn't!). One day when I was about 5 or 6 a kid bought in a prop gun that his dad had made for James Cameron's "Aliens" to show the class. I was amazed and fascinated by how such a flimsy bit of fiberglass could be construed on screen as a convincing weapon - a few years later I saw the movie and the weapons all look fantastic! My mum was a florist in the village too - and she had done the floral arrangements on a couple of the Bond films, and again my respect for her career escalated when she told me about this like it hadn't been a big deal to her. By the time I was 7 years old I knew that I wanted to make films - and when I was about 13 or 14 I got to go and work in the summers for a TV director who lived in the village. He had a little studio in his garden where he would make stuff for fun, and I got to tag along and learn the trade a bit from there. I was sold on it! I studied film at college and then university before getting my first job as a PA to a post production supervisor and have never looked back! I love working in the industry, and have done stuff in just about every department you can imagine over the years. Why the Horror genre? Are there films or other works you could point to which sparked your initial love for horror? I simply love horror. Not just film, but literature too. I can pinpoint the exact moment I realized I wanted to make horror films too - when I first saw The Shining - I was 7! I sat transfixed (it was playing on TV) and when the credits rolled I told my mum "I want to make movies like this"! What I love about horror is how it has the ability to elicit these emotions in an audience that they ordinarily wouldn't feel - the utter terror and nagging sense of foreboding that stays with you after a good horror movie - don't get me wrong, I love most genres, but horror somehow manages to completely immerse an audience in the moment - and I want to be able to replicate that! Ok, this is a tough one. Quite often we see debates held among fans of the genre as to what constitutes a horror film. Throw your hat into the ring, what do you think the requirements are which qualify a film as horror? Horror is, or can be, largely subjective for sure. I don't find there to be anything scary about watching slasher movies on the whole - but I fully appreciate that huge swathes of the horror loving community do. For me, first and foremost, a horror film has to be one which engages the audience with the characters. If you don't feel anything for the protagonist (whether it's positive or negative), then you can't be scared. So characterization is paramount. From there, it's about what your audience is scared of - by allowing a little room for their imaginations to run riot (by not showing everything), you have a better chance at achieving that. I think that's why movies like the original Blair Witch or Paranormal Activity work so well - you don't see stuff - you might hear it, or be pointed towards it, but on the whole the filmmakers leave it up to your imagination (which has far scarier things in it than you can put on screen!). I personally love films too which leave an ambiguous or intriguing ending - I don't want anything to be too well wrapped up - that way the fear has no boundaries after you've finished watching it. Let's talk about your current project. What lead to the eventual development of 'Dogged'? How'd the story come about? "Dogged" has been ongoing for about 3 years now in one way or another. Initially we made a short film which we tailored a little bit for inclusion on the BBC show "The Fear". It was essentially a talent show to find undiscovered horror filmmakers. The film was really well received on the show - and so we decided to send it out for some reviews and to a few festivals. We were blown away by the positive response we got to it - it tapped into something with people. Whilst it was doing the festival rounds we discussed making a feature - the 4 of us at Ash Mountain Films all had quite different ideas about how we could expand it - but we finally agreed on one, and then set about scripting it. We ended up doing 19 drafts of the script - lots of changes here and there to get it to a place that not only all 4 of us were happy with, but to a place where it was achievable to actually get it made. Then came the Kickstarter campaign - we'd done Kickstarter before to fund a couple of our shorts, and it had worked - but we had no idea how difficult raising £15,000 would be! We made it in the end after a 60 day campaign, and then we shot the film from August through to November last year, and finally finished it in late March. The story itself was an expansion of the short - we had to isolate the main characters from mainstream civilization in order for it to be believable, and I happened upon this little tidal island where they'd filmed some of "The Woman in Black" with Daniel Radcliffe - I couldn't believe I'd never heard of it before, but as a tidal island, it made sense to set our movie in that sort of location. The rest, as they say, is history! It can't be easy to campaign for funding. Was that one of the more difficult parts in getting the film started? Absolutely, the funding was without a doubt the hardest part of getting the film made. We sent out around 80,000 messages one way or another over the 60 days - I think it's easier if you're an already established filmmaker with feature credits behind you as you have an audience who're willing to contribute - but the brutal truth and reality of crowdfunding is that the first time you do it on a scale like this, the majority of your backers are friends and family. We had one extraordinarily generous backer who put a big wedge of the budget up, and without him, we wouldn't have got to our goal I don't think. The great thing about the Kickstarter campaign though was that it galvanized us as a unit - we had all worked so unbelievably hard to raise the funds, after that making the film seemed like piece of cake! On the production side of things, what challenges did you face? Do you feel these helped you to grow as a filmmaker? There's always huge challenges with any film - but when it's a little indie film in quite a niche sub-genre (Folk Horror), then things are both harder and easier. Locations were a big expense and challenge - negotiating to shoot in places like a church weren't easy for example. Division of labor too was hard - I personally felt a huge responsibility to the 211 Kickstarter backers to make the film better than they were expecting - and Lee, Chris and Matt who produced with me felt the same - so we had to do crazy hours for a period of about 15 weeks whilst holding down our day jobs. Things like last minute runs to Costco for catering supplies, begging stores to let the cast & crew use their bathrooms, heavy lifting of the lighting equipment and genny, borrowing vans to transport the kit around and stuff - I was exhausted by Christmas! But all of these things do help you grow - we had a pretty large cast and crew - we were very ambitious for the budget level - and they all worked without a cent - everyone worked at a level I have never even seen on professional film sets - and everyone took responsibility to the nth degree within their own departments - surround yourself with perfectionists is definitely the way to go! I learned a lot about myself (sounds corny doesn't it?!) during the shoot - that I could get by on 2 hours sleep a night was probably the biggest revelation to me haha! The promotional art work for the film is really something special, definitely eye catching. Are you heavily involved in shaping this aspect? Thank you! Yes and no is the honest answer. For the initial artwork I had quite a clear idea of what I wanted (the hand casting the shadow of the rabbit on the wall in a sinister fashion) - but the genius behind it is actually Lee (Wignall), our very talented editor and producer. He's an amazing artist first and foremost - and he knew exactly how to bring that concept to life. The new poster is all the work of Lee - his concept, his design, and he made it using some of the production stills as a basis (stills were by the amazing Matt Wignall)! When he showed it to me I loved it straight away! What do you think you'd like to do, after 'Dogged'? I have a few scripts on the go at the moment as well as a couple of completed ones - a real range of sub genres too - I like to challenge myself, but I'm also aware of the difficulty of raising finances for more niche work - so I'm tempted to perhaps go for something with a slightly broader appeal - but feature work for sure. 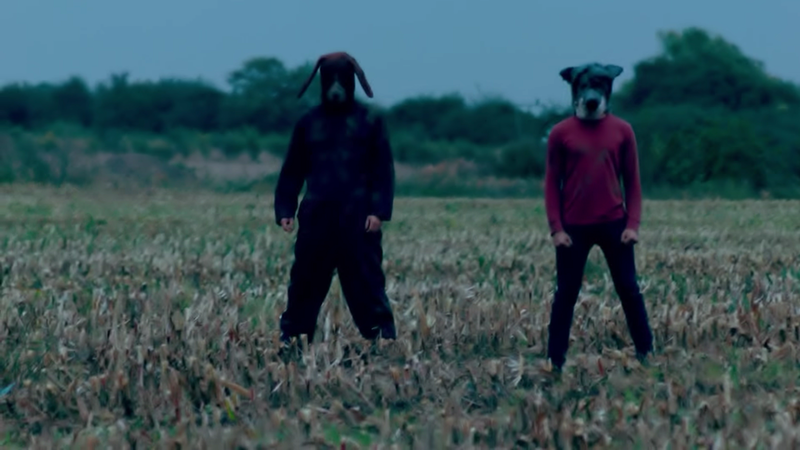 I hope that "Dogged" gets into a few festivals so that we at Ash Mountain Films can build up a loyal audience who might be willing to back us in future - I've seen that path work well for some other filmmakers recently, so I'd like to make films that people really want to see that are a little out of the ordinary mainstream. Indulge us, as horror fans, give us your top 5 films in the horror genre. That's the toughest question so far! I'd say, The Shining (Kubrick), Jaws (I consider that horror, some might not! ), The Thing (Carpenter), A Nightmare on Elm St (Craven), The Exorcist (Friedkin), but honestly I love soooo many more! It's a tough industry to crack, any parting advice for aspiring filmmakers? Don't try to crack it! The savage truth for many filmmakers is that it won't ever be anything more than a very expensive hobby - embrace that - don't try and make movies for audiences who aren't there - make stuff that YOU would want to see yourself - be artistic (don't worry about tropes, just study good writing techniques and methods), be fearless (it's easier to get forgiveness than permission), and just go out and do it (you can shoot a movie on your phone with your friends, you don't need expensive equipment and crews with experience). What's the worst that could happen? !